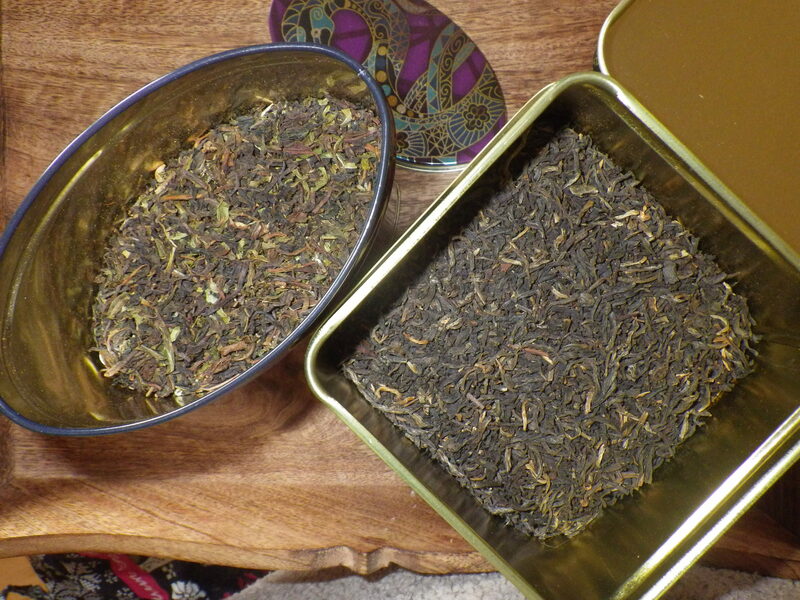 I continue to enjoy my loose Nilgiri tea – I took my tin to the shop for a refill last week and thus avoided bringing any packaging home. Of course, it doesn’t arrive at the shop without packaging. I’m guessing that they don’t have wooden tea chests round the back from which they refill their own tins that are on display in the shop. No, by buying loose tea and using my own container I am only eliminating one element of the packaging… but still that is one element less. The shop where I buy my tea from put it, by default, into bags that include a layer of plastic (maybe cellophane), a layer of foil and a layer of paper. On the rare occasions when we have bought tea or coffee without taking our own receptacles, we have felt it necessary to dismantle the bags carefully before putting the component parts into the recycling. The ultimate in avoiding packaging… eventually! 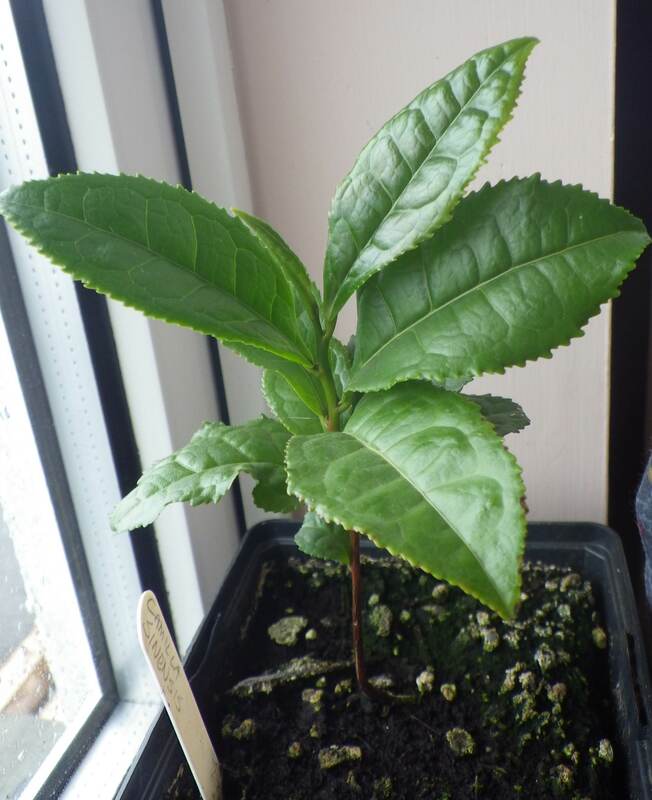 In fact, I have not been looking for any other ways of making my tea-buying more ethical, but one was presented to me last Thursday, when my friend Ann gave me a Camelia sinensis plant. That’s right – I’m now the proud owner of a little tea plant. Apparently they like acid soil (less than pH 5) so it should be right at home here in west Wales. Being plants of the Himalayas, tea bushes can survive outdoors in the UK in areas where we don’t have severe frosts. So, in theory I could plant it in the garden. However, I know from experience that many plants drown or rot in our soil over the winter, so my inclination (at least for now) is to keep it in a pot in the limery over the winter and out on the new patio during the summer. The small bit of research that I’ve done suggests that, if I can get it to thrive, it’s relatively easy to make green tea from the young leaves – you have to steam them and then dry them – so that is something I would like to try out. I’m sure I will never be self-sufficient as regards tea, but it would be nice to be able to grow at least a little of my own. I have been planning a tea bed in the garden, though I’d not thought of growing a tea plant, I’m just looking at herbal teas and other plants that can be used to make teas. That would cut out packaging, tea-miles and any form of processing. We already enjoy four different types of mint along with some other herbs. I do use lemon balm and mint from the garden to make tea, but it’s not the same as Camelia sinensis! I wouldn’t have thought to grow “real” tea myself, but the plant was a most welcome gift. I was just about to write exactly this! I’ve been looking at coffee bushes for the garden – we’re a bit too hot here for tea, but coffee’s another story. Plus you can eat the coffee ‘cherries’ the beans are naturally packaged in! I love the idea of you working in the limery surrounded by neatly clipped tea-topiary! Perhaps you should try ebay too! Just a few days ago I heard all about a grower here in good old NZ who grows organically and ethically and offers employment to immigrants too. I was really impressed! The comment was made that the locals thought he was barmy and had a really expensive camellia growing habit for some years until his product was ready for the market. I couldn’t afford it – it is premium and packaged to impress – but have a look at this for a peek at how it’s done 🙂 https://youtu.be/fAdxi6pVMSg Is it possible the limery could become a teaery? Or smoke them for a touch of Lapsang. You never fail to impress me! Wow. Maybe you can see how this plant does and grow more if it’s all good. Isn’t anticipation great? I love the way you make me think differently about things! This is getting more interesting by the moment. How exciting to grow your own tea. I’ll be watching and learning. Look for somewhere with acid soil! Ooh, a tea garden on your balcony sounds fab! I have some tea plants, which are all doing their best to look dead. I put them in the polytunnel on arrival last year and managed to scorch them. I will be avoiding that this year by putting them out as soon as the weather warms up a bit. I’m told that you need to overwinter them inside for the first few years and can then plant them out. Very shocked to hear on the TV tonight that tea bags are 25% plastic! Yuck! Were you successful in growing your own tea? I do have a plant, but it’s still quite small. I am hoping it’s going to get bigger in the future! Glad it is still going!